The 25th Annual General Meeting of Palli Karma-Sahayak Foundation (PKSF) was held at 3:30pm, on 29 December 2014 at PKSF Bhaban. Dr. Qazi Kholiquzzaman Ahmad, the Hon’ble Chairman of the Foundation presided over the meeting. The members of the General Body namely, Dr. Pratima Paul-Majumder, Dr. A.K.M. Nurun Nabi, Dr. Mihir Kanti Majumder, Dr. M. A. Quassem, Mr. Khondkar Ibrahim Khaled, Ms. Nihad Kabir, Professor M.A. Baqui Khalily, Mr. C.M. Shafi Sami, Dr. Bondana Saha, Ms. Bulbul Mohalanabish, Mr. Md. 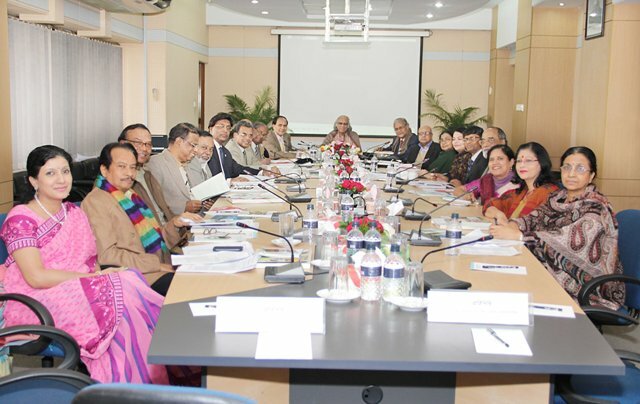 Emranul Haque Chowdhury, Begum Razia Hossain, Mr. Ishtiaq Uddin Ahmed, Mr. Nazir Ahmed Khan, Dr. Nazneen Ahmed, Professor Shafi Ahmed, Mr. Munshi Faiz Ahmad, Mr. S.M. Wahiduzzaman Babur and Mr. Md. Abdul Karim, Managing Director, PKSF were present in the meeting. In the meeting, Hon’ble Chairman provided a detailed description of PKSF’s activities. In his speech, he informed of the progress of multidimensional programs and projects undertaken by PKSF. He also referred to ENRICH, a people-centered holistic program that PKSF is implementing to alleviate poverty through establishing human dignity. In addition, the Chairman notified the meeting about various programs that were arranged as part of the year-round celebration of PKSF’s Silver Jubilee program. Hon’ble members praised PKSF’s activities and initiatives. They also gave their valuable suggestions. The Managing Director updated the meeting regarding the progress of the implementation of the decisions/suggestions of last General Meeting held on 24 June 2014. The meeting expressed its satisfaction on the advancement of the implementation of overall activities of PKSF. The Audit Report (FY 2013-14), audited by S.F. Ahmed & Co., was also presented in the Annual General Meeting. After having detailed discussion, the report was approved at the meeting. The present membership tenure of some of the non-government members came to an end. Hence Mr. C.M. Shafi Sami, Dr. Bondana Saha, Ms. Bulbul Mohalanabish and Mr. Md. Emranul Haque Chowdhury, who had been nominated as non-government members, were given re-nomination for the next two years.